The number of “license to carry” gun permits issued in Massachusetts spiked last year in anticipation of last summer’s passage of a sweeping gun control bill that tightened the state’s already strict firearms laws, according to a Globe analysis of state firearms data. In the months prior to the law’s signing, many gun owners feared firearm licenses would soon be restricted or even eliminated, so “people wanted to make sure they got the license in case the state did something to limit them,” said Wayne Sampson, executive director of the Massachusetts Chiefs of Police Association. “There was a huge uptick while the Legislature was debating this issue,” he said. Statewide, the number of active Class A licenses — the so-called license to carry category that broadly includes the right to carry a concealed weapon — grew nearly 12 percent between 2013 and 2014. That was a significantly greater jump than in past years, a Globe review of data from the Firearms Records Bureau found. Overall, the number of active gun licenses of all types grew 5 percent, with a total of 355,272 in the state last year. All but five of Massachusetts’ 351 towns and cities saw increases in the number of active Class A licenses from 2013 and to 2014. The new legislation, which passed in August, built on the state’s 1998 gun laws, often considered the toughest in the country. Among the provisions included in the law was tightening the requirements for applicants seeking the state’s Firearm Identification Card to match those of the Class A license — perhaps most notably, adding a provision that allows police chiefs to petition the courts to deny a Firearm Identification Card to an applicant not judged suitable. The Firearm Identification Card lets holders possess and transport a rifle or shotgun. The change was opposed by the National Rifle Association, which said on its website that giving police chiefs such discretion could allow licensing officials to deny Firearm Identification Card applicants on “mere arrests or police contacts that never led to judgments by a court.” NRA officials did not return multiple Globe requests for comment. The new law did not change the basic requirements to get a Class A license. Applicants must still pass a background check and get approval from their community’s licensor, often the chief of police. New applicants must also provide proof of firearm safety training. Even then, firearm licenses need to be renewed every six years. “When you get a license, you have a card saying you’re a law-abiding citizen,” said Leo Richards, 51, of Framingham, a firearm safety instructor and partner at the Weston Shooters Club. The legislation did streamline the license renewal process, and required a written justification for license denials. With about 318,000 licensees in 2014, the Class A license was the most popular in the state; only about 34,000 residents held Firearm Identification Cards. Following passage of the new law, more gun license applicants, including former Firearm Identification Card holders, are opting for the higher-level permit, said Sampson. And the Gun Owners’ Action League now encourages its members and trainees to get the Class A license, said Jim Wallace, the league’s executive director. Jason Gregg, 39, said he upgraded his lapsed Firearm Identification Card to a Class A license following the change. “It’s $100 for the Firearm Identification Card and $100 for the license to carry. It’s the same application, just a different box,” said Gregg, who lives in Framingham. Last year’s spike in Class A licenses followed lesser annual increases with a median of 5 percent over the past several years. Since 2008, the number of these licenses has grown in all but two Massachusetts municipalities, Gosnold and Chesterfield. In 11 communities, including Boston, the number has more than doubled. The map excludes the 12 towns that had less than 100 licenses in 2014. The increase in Class A licenses was particularly pronounced from 2013 to 2014 in several Eastern Massachusetts communities, including Lowell, with a 21 percent jump, Quincy, with an increase of 20 percent, and in Boston, with an 18 percent hike. Personal protection is the main reason that applicants cite for getting licenses in Boston, said McDonough. Quincy police Chief Paul Keenan said there has been a significant uptick in the number of gun permits sought in his city, compared to past years. “There’s a lot more demand for licenses to carry than what used to be,” Keenan said. The vast majority of the state’s gun license holders now have the right to carry their firearms, which gun control advocates say could increase the likelihood of violence involving the weapons. “The more guns out in circulation in society, the more likely someone shoots it by accident or uses it when they get mad,” said Jack McDevitt, director of Northeastern’s Institute on Race and Justice and chairman of the gun violence task force assembled by House Speaker Robert DeLeo. But Victor Grillo, the Weston Shooters Club founder, said the vast majority of license-to-carry holders he knows from his club do not carry concealed firearms. Vincent Alfano, police chief in Bolton, said an increased interest in shooting sports, such as hunting and target shooting, is also driving the uptick in licenses. On top of that, more women are getting licensed, he said. “Ten years ago, when I first started, 98 percent of applicants were male. Now, it’s split 50-50,” said Alfano, who chairs the Massachusetts Chiefs of Police Association’s firearm committee. As a child, Rebecca Hart, 28, of Ashland, went to the shooting range with her father. In high school, she competed on an air rifle team. Each year, more and more women would join the team, she said. 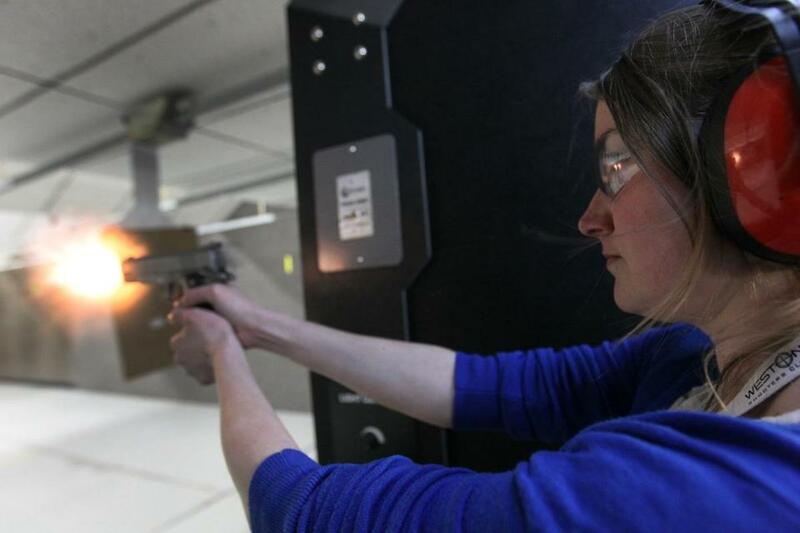 The Weston Shooters Club, an upscale “gun-try club,” opened last fall to fill the “pent-up demand” of the growing population of gun licensees in Greater Boston, said Grillo. Within five months, about 500 members joined the club, he said. The shooting club’s clientele hail from Boston and its suburbs and include doctors, lawyers, and athletes, Grillo said. Some come alone, others with their spouses or families. Inside the club, there’s a flat-screen television, a table for smoking cigars, and a kitchenette offering coffee and sodas. It aims to provide a safe, clean environment where all types of shooters will feel comfortable, said Grillo.